From time to time we will post news for you here including articles on foot related topics we hope you find interesting and useful. Please contact us and make any suggestions about any areas of foot health you would like to feature here. Listen up Walkers and Runners – ‘Black Toenails’ are Preventable! At the end of a long walk or run, you may notice that a toenail has turned black, blue, or dark red and is getting painful. This change of colour and pain is due to bleeding under your nail, which is also known as a “subungual hematoma”. This can also happen if you drop something heavy on your toe or kick/stub your toe against something hard. Summer’s Ending… Now is the time to talk about chilblains! Chilblains are a very common condition affecting the old and young alike and they have no quick fix, but the good news is that with some preparation they can be prevented in many (not all) people. If you are a regular sufferer following the advice below may not totally prevent you getting chilblains but I’m certain it will reduce the severity and number of chilblains you get. 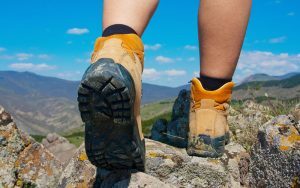 At Footfriend we get asked all the time on what to do or what to look for when buying walking boots. Here are our top tips which should give you confidence and hopefully avoid most problems to get you trouble free walking boots which will soon become your “new” friends. Footfriend are proud to announce we’re the first clinic in Yorkshire to offer Microwave Therapy for the treatment of verrucae. The importance of skincare for your feet – yes men, you too! Summer is coming! This is the time of year when our skin is likely to be at its driest, and is on display for all to see! Skincare is important and easily addressed. Read on for our top tips on keeping the skin on your feet in top condition.